The uncrewed Orbital ATK Cygnus cargo ship S.S. J.R. Thompson is captured by a robotic arm at the International Space Station on May 24, 2018. The Cygnus delivered more than 3 tons of supplies to the station's Expedition 55 crew. An Orbital ATK Cygnus cargo ship arrived at the International Space Station early Thursday (May 24) to deliver more than 3 tons of science gear and supplies — and some goodies for astronauts, too. NASA astronaut Scott Tingle captured the uncrewed Cygnus spacecraft using the space station's robotic arm at 5:26 a.m. EDT (0926 GMT). It was attached to the an Earth-facing port on the station's Unity module about 3 hours later. The spacecraft is packed with 7,385 lbs. (3,350 kilograms) of science experiments, equipment and basic supplies, like clothing and food, for the station's Expedition 55 crew. But it contained some extra treats for the astronauts, too. Orbital ATK launched the Cygnus spacecraft Monday (May 21) from NASA's Wallops Flight Facility in Virginia using an Antares rocket (also built by the company). It is the ninth of 11 cargo delivery missions for NASA by Orbital ATK under a $2.9 billion resupply contract. Dulles, Virginia-based Orbital ATK named this Cygnus the S.S. J.R. Thompson after J.R. Thompson, a NASA veteran and Orbital ATK executive who died last November. Among the science gear delivered by Cygnus is the Cold Atom Laboratory, which will use lasers to create the coldest spot in the universe on the station. Another experiment includes a sextant to test how the centuries-old navigation tool could be used to navigate spacecraft in an emergency. And an experiment called Biomolecule Extraction and Sequencing Technology will study how long-duration spaceflight affects the DNA of astronauts, plants and microbes. The Cygnus spacecraft will remain linked to the space station until July, when it will be packed with 3 tons of trash and commanded to intentionally burn up in Earth's atmosphere. Before it burns up, the spacecraft is expected to deploy several tiny satellites, called cubesats, as part of its mission, Orbital ATK representatives have said. Orbital ATK is one of two commercial companies with NASA contracts to deliver cargo to the International Space Station under the space agency's Commercial Resupply Service 1 program. The other company is Hawthorne, California-based SpaceX, which has flown 14 of 20 planned missions with its Dragon capsules and Falcon 9 rockets for NASA under a contract worth just over $3 billion. NASA has also picked Orbital ATK, SpaceX and Sierra Nevada Corp. to supply the space station under its new Commercial Resupply Services 2 program. The International Space Station is currently home to six astronauts and cosmonauts making up the Expedition 55 crew. In addition to Tingle, the crew includes NASA astronauts Drew Feustel and Ricky Arnold, Russian cosmonauts Oleg Artemyev and Anton Shkaplerov (who commands the mission) of Roscosmos, and Japan Aerospace Exploration Agency astronaut Norishige Kanai. 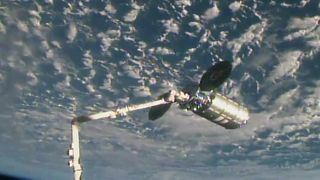 Editor's note: This story was updated at 9:31 a.m. EDT to include the successful berthing of the Cygnus spacecraft at the space station.